His picture has hung in my living room for over 40 years. I always thought he had a kind face. I know very little about about him except the few details I remember being told by my mother when I was a child. 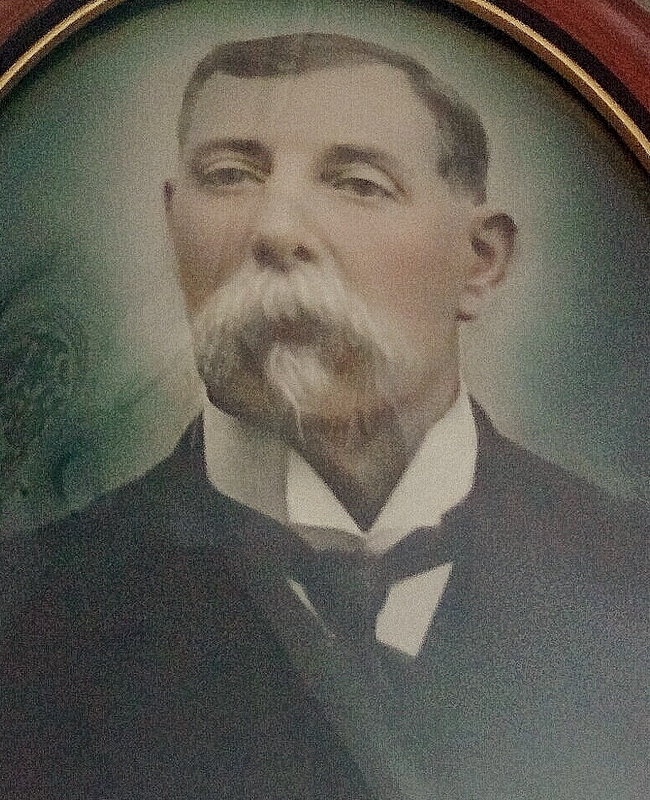 He was Thomas MacMillan, my mother’s father. It is Family Day Weekend here in Alberta, so what better time to try and discover something about this man…. my Grandfather. I knew he worked the boats along the coast of South America. My mother and her siblings had been born there…David and Daisy in Callao, Peru and my mom, Agnes, in Coquimbo, Chile. He was supposedly born in Glasgow, Scotland, but how he got to South America and married a local woman…well who knows! When I was looking at old pictures in a Steamer Trunk in the basement, I had come across a picture of him on a ship…I assumed this was one of the Coastal Steamers he worked on up and down the coast of South America. I knew he had died in Coquimbo prior to my in in mom, her mother and sister Daisy going to England to join her brother David, who had been there to fight in WW1. I believe she said he had been kicked in the head by a horse and died as a result of the injury. So where does one start in a search for someone on whom you have almost no information, including a Birth date. Fortunately I have a Genealogy Family…those are the folks that have an addiction to Family History….their own and that of others…and who are willling to help out others. Joyce Willard and Lynn Fogwill are two such people. They gave me hints on how and where to search in Scottish Records. Lynn, having Seafaring Ancestors, gave me great clues as to the hierachy on a ship, apprenticeships and the Maritime Archives at Memorial University in Newfoundland. So I began my latest quest with that infomation in mind. Apprenticeships…..many of my Paternal Ancestors has apprenticed as Carpernters and Bakers….but an Apprenticeship for someone going to sea…? This collection contains lists of young men who were indentured to merchant navy ships between the years 1824 and 1910. They include details such as name, age and date at registration or indenture, vessel, port of registry, and birth year and place. Under the Merchant Seamen, etc, Act 1823 (4 Geo IV c 25) Masters of British merchant ships of 80 tons and over were required to carry a given number of indentured apprentices. These had to be duly enrolled with the local Customs Officer. These provisions were extended by the Merchant Seamen Act 1835 (5 & 6 Wm IV c 19) which provided for the registration of these indentures. In London they were registered with the General Register and Record Office of Seamen and in other ports with the Customs officers who were required to submit quarterly lists to the Registrar General. In 1844 it was provided for copies of the indentures to be sent to the Registrar General, and although compulsory apprenticeship was abolished in 1849 the system of registration was maintained. Under the Merchant Shipping Act 1894 (57 & 58 Vict c 60) a parallel arrangement was introduced for apprentices on fishing boats. 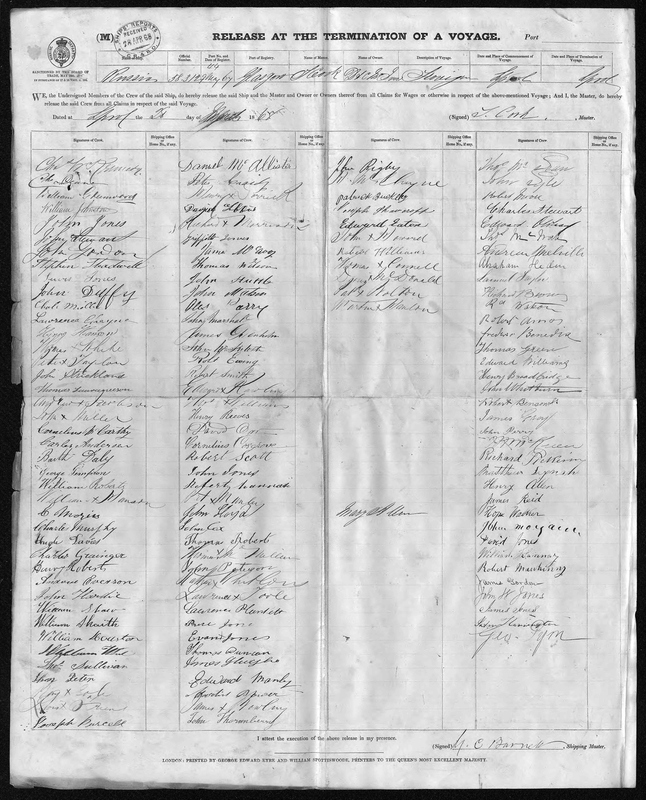 The Ancestry Site is publishing amazing records these days and I was able to locate a record of Indenture for Thomas MacMillan. Not 100% sure this is my Thomas, but for now this is a search in progress. The age would line up with what I think would be his birth date. The records indicates that Thomas was 15 years of age when he was Indentured on October 7, 1864 for 6 years to Jonathan Starling out of Grimsby, aboard the Wanderer #15888. Interesting that I call my blog A Genealogist goes WANDERING….perhaps it is in the GENES and we are both WANDERERS! Grimsby is a large town and seaport in Lincolnshire England, on the South Bank of the Humber Estuary close to where it reaches the North Sea..In 1857 there were 22 vessels in Grimsby. Six years later in 1863 there were 112. The first two legitimate steam trawlers ever built in Great Britain were based in Grimsby. By 1900, a tenth of the fish consumed in the United Kingdom was landed at Grimsby, despite the many smaller coastal fishing ports and villages that also supplied the nation. I searched a number of Crew Lists and found another Thomas MacMillan. This one was aboard the Russia out of Liverpool in 1868. Now according to the term of indenture on the Wanderer he should have been there till 1870….but things happen…. in 1868 he would have been around 18/19. This Record is for the Release at Termination of a Voyage…March 28, 1868. On voyage Liverpool for Philadelphia with 114 passengers, 89 crew and general cargo, collided with ss HARMONIDES (3521g/1891, River Plate for Liverpool) 45nm WSW of Holyhead in dense fog and sank; 2 lives lost in launching one of the boats, but remainder transferred to HARMONIDES, which later arrived Liverpool. This collection of crew lists held by the Liverpool Record Office includes records for 912 ships whose home port was registered as Liverpool, England. The lists contain information on ship voyages, crew members, and apprentices. Many of the records are grouped together as agreement booklets or ships’ logs. Crew lists vary in detail but can include the name or signature of the crew member, age or birth year, birthplace, nationality, residence, service on other ships, rate, date and details of engagement and discharge, reports of character and ability, and other assorted notes. Once you locate your ancestor on a particular ship, do a search for just the name of the ship to find logs and other ship information. Ship information pages consist primarily of the crew list cover pages and contain information regarding a ship and its voyage(s). The name of the ship, port of registry, and date are almost always present, but these documents do not contain lists of names. To find the Agreements of a particular vessel and year, researchers have to locate a ship’s official number: the MHA documents are filed by this number. Watching the video on this site “Welcome to the Maritime History Archive” will explain why: the following explains how you find a number, and then how you can check for what documents have survived and which now constitute archival holdings. In the Mercantile Navy Lists [See Glossary], find the name of the vessel alphabetically. There may be several vessels with the same name, but the official number is unique: it never changed for the lifetime of a vessel regardless of changes of name or purpose. Several vessels may have the same name, so it helps to have as much information about the vessel, including Port of Registry, Tonnage, and Ownership. 1868, 1875, 1876, 1878, 1880, 1882, 1891, 1892, 1896, 1899, 1904, 1907, 1911, 1913, 1914, 1918, 1919, 1921, 1923, 1924, 1925-1940, 1947, 1949, 1951, 1953, 1955, 1957-1965, 1968, 1973. 1857-1864, 1866-1908, 1910-1914, 1916-1920, 1922. Researchers can also check their local libraries or archives for copies of the MNL near their relevant year. It is becoming easier to search the Mercantile Navy Lists online. The Maritime History Archive and the Memorial University Digital Archive Initiative now offers the Mercantile Navy Lists and Maritime Directory online in their self-search collection. The Crew List Index Project (CLIP) is also a useful resource for finding official numbers and other vessel information through their online finding aids. Once an official number is determined, researcher can use the number to search the Maritime History Archive Index, which will show the years for which the MHA has documents, including the main type of document, and whether other archives have holdings for vessels and years. See the guide to the MHA codes and Agreements and Accounts for the different types of documents. For example, if we search the MHA Index for the official number of the Brio (97966), the Index tells us the MHA has holds at least document for each of the years: 1891, 1892, 1893, 1894, 1897, 1899, 1900, 1902, 1903, 1904, 1906, 1908, 1909, and 1910. As there was still no alternative means of transport along the 4000 miles of coastline from Valparaiso to Callao travel between the two ports on a luxurious PSNC coastal passenger ship was a necessity. The weekly service continued to be operated by substantial ocean going ships but their profile differed from the conventional transoceanic passenger ships. The main deck was mainly open for both deck passengers and cattle while the upper deck had staterooms for overnight and week long journeys. During the Boer War between 1899 and 1903 the Orcana was deployed as a hospital ship and the Orissa, the Orotava, the Ortona and the Victoria were requisitioned as troopships. In 1900 the Potosi (2) was delivered and immediately sold to the Russians for use during the Russo-Japanese war. The small coastal steamer Taboga was seized by the Colombian Government for use as a warship but released when the Royal Navy intervened. In 1902 PSNC’s Royal Charter was extended for a further 21 years and the crown on the house flag changed from the Royal Crown to the St Edward’s Crown. Between 1890 and 1904 an number of iron hulled ships were converted into coal storage hulks at the major South American ports as it was considered cheaper to bring ships alongside for coaling and storing rather than to undertake the operation using local lighters. At some ports larger ships did not go alongside a quay but used PSNC’s pier-like jetties or tenders. In the UK the Merseyside ‘naval yard’ was closed down, the stores, maintenance and engineering staff being dispersed, and their berth was moved across the river to the Alexandra Dock in Liverpool. PSNC sold their interests in the Australian route to Royal Mail Line in 1905 together with their share in the Orient Pacific Line and the Oroya (2), the Oruba (1), the Orotava and the Ortona. With these vessels the Royal Mail incorporated the Orient-Royal Mail Line in February 1906 and gave the ships distinctive buff-yellow funnels. The Orellana and the Orcana became surplus to requirements and were sold to the Hamburg America Line. Investment in new ships continued and during 1906 four new cargo ships were delivered demonstrating the company’s propensity for ordering in bulk. In 1908 the Orcoma (1) was delivered. Referred to as the ‘all-electric’ ship she was the first of the company’s vessels to exceed 10,000grt. The introduction of certificates of competency gave engineers in the British mercantile fleet a status they had not previously enjoyed and it put them in the same position as deck officers. Standards of training still varied widely and the Institute of Marine Engineers, established in 1889, became the driving force behind moves to change the rules relating to apprenticeships. The Board of Trade, which controlled the granting of British certificates of competency, had initially insisted upon an apprenticeship lasting a minimum of three years, six months of which had to be spent in a drawing office. As shore apprenticeships throughout Britain lasted a minimum of five years the Institute requested that this term should also be required for potential seagoing engineers as it would ensure that they had completed their apprenticeships. This request was resisted under pressure from influential shipowners who feared that a shortage of engineers would result and eventually a compromise was reached on a four-year apprenticeship with allowance being granted for time spent at a technical college. New regulations were introduced in 1901 and since then they have been frequently amended with respect to the training and examination requirements ensuring that the high standard of the British certificate of competency or ‘ticket’ is recognised throughout the world.